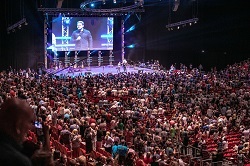 BUDAPEST, HUNGARY (BosNewsLife)-- Half a million Hungarians have received pamphlets encouraging them to accept the love of Jesus Christ, and nearly 1,500 people indicated they want to "commit" their lives to Him during a massive evangelism meeting in Budapest, organizers said. The Christ for All Nations group (CfaN), which organized the three-day "FIRE Conference," also said more than 14,000 people attended the event in Hungary's capital from 24-26 August. Some "1,450 attendees submitted personal decision cards, signaling their choice to commit their lives to Jesus. That's more than 10 percent of the crowd," CfaN added in a statement. Additionally, volunteers distributed 500,000 Hungarian language copies of Evangelist Daniel Kolenda's new booklet "Reckless Love," the group explained. "A staggering 25 percent of the city received a copy of this short but powerful volume. Reckless Love explores Christ's harrowing parable of the prodigal son – a tale of God's profligate, never-ending, no-cost-too-high-love for humanity. Now, half of a million people (plus their family and friends) can read this clear, personal invitation to "come home" in their language," CfaN said. The evangelism campaign took place in a nation that nearly three decades ago was a Communist-run country where several groups of devoted Christians experienced persecution from authorities. After the collapse of Communism, more freedom returned to Hungary, though critics have expressed concern about policies of the current government limiting the number of churches that are recognized by the state. Despite political turmoil, evangelical groups and churches have reported church growth in Hungary. And CfaN suggested its team could freely operate in Budapest, a city of nearly 2-million people. Among speakers at the 'FIRE Conference' were evangelists Daniel Kolenda, Todd White, Ben Fitzgerald, Eric Gilmour, Jean-Luc Trachsel, Peter Vandenberg, and Russell K. Benson. "Plus, the crowd engaged in worship lead by some of the best leaders, vocalist, and musicians in Hungary," CfaN said. The music team was joined by "Worship-Evangelist" and CfaN staffer, Charles Ciepiel. "It's truly tremendous to see God sweeping urban Europe. Most of Europe consists of 1 percent Jesus-following Christians. And cities are particularly hard here. So, to see 14,000 people show up for a Holy Spirit-filled meeting. It just brings tears to our eyes." He noted that the "sincerity is so real" among Hungarians choosing to become Christians. "God is truly starting something in Budapest, and it's going to spread," Ciepel predicted. CfaN's Vice President, Peter Vandenberg echoed that sentiment with his "commanding" opening prayer, the group added. "May the fires of revival spread from here, right across Europe! ", CfaN was quoting him as saying. CfaN claimed that "God validated the Word with numerous miraculous healings." It cited alleged healing of one woman who suffered a shoulder injury years ago that left her in chronic pain "so severe that, often, she could barely sleep." During one of the services, "the Holy Spirit moved on her. Suddenly, she was throwing her arm in the air, praising God for a total, supernatural recovery. With numbers and testimonies like this, we can be sure that the tide is turning in Europe," CfaN concluded. Evangelist Reinhard Bonnke founded CfaN in 1974. The group, now led by Evangelist Kolenda, organizes mass-evangelism in Africa and other countries. The activity is part of what it calls a mission to "equip the church to fulfill Christ's Great Commission (to preach the Gospel among all people). The group says that 78-million people "have chosen to follow Jesus and hundreds of thousands have experienced the miraculous, healing power of God" at CfaN gatherings over the last four decades.